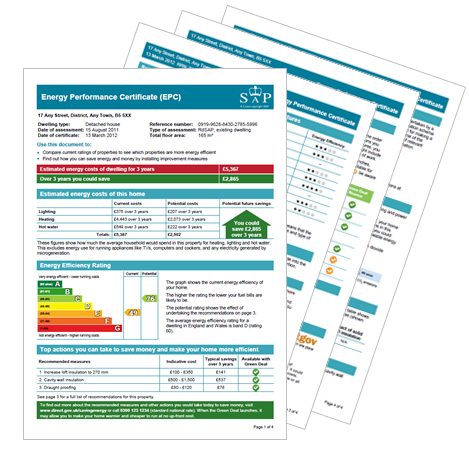 Whether you’re selling or letting, Energy Performance Certificates (EPCs) are a legal requirement. Since the 21st May 2010, the HIPS packs containing EPC information have been abolished. Due to this, sellers now only need to provide the EPC. The whole idea of an EPC is to show potential purchasers or tenants how energy efficient the property is. It gives the building a standard energy and carbon emission efficiency grade from ‘A’ to ‘G’, where ‘A’ is the most efficient. The average to date is a D.
How Long Do EPC’s Last? Under current legislation, the shelf life of an EPC is different for sales and rentals. An EPC for sales currently has a 3 year shelf life, whereas an EPC for rental purposes has a 10 year shelf life. An Energy Performance Certificate (EPC) is a legal requirement. The energy rating is meant to be representative of of the properties energy efficiency, very similar to the system used on washing machines and other large electrical appliances. They are a compulsory requirement for Landlords and Property Sellers to provide. EPCs carry ratings that compare the current energy efficiency and carbon dioxide emissions with potential figures that your home could achieve. Potential figures are calculated by estimating what the energy efficiency and carbon dioxide emissions would be if energy saving measures were put in place. The rating measures the energy and carbon emission efficiency of your home using a grade from ‘A’ to ‘G’. An ‘A’ rating is the most efficient, while ‘G’ is the least efficient. The average efficiency grade to date is ‘D’. We work with a number of qualified and reputable Energy Assessor’s who we can instruct to arrange your EPC. We charge a fixed rate of just £95.00 (+VAT) for each EPC. Please contact our Property Management department on 02380 703106. Please remember, it is an offence to market a property for sale or rent without a current EPC certificate.